convenience features such as power windows with driver’s auto up/down function, a satellite radio antenna with pre-wire, USB connectivity, and an available back-up camera. The 2010 Toyota Camry Hybrid features dynamic styling, impressive performance and handling, Toyota’s sterling reputation for quality and safety, and a generous suite of standard equipment. As a fuel-efficient, low-emissions hybrid vehicle, the Camry Hybrid may qualify for government-granted incentives: more information may be found on Toyota Canada’s web site, www.toyota.ca. The 2010 Toyota Camry Hybrid is now on sale at Toyota dealers across Canada: it carries a manufacturer’s suggested retail price starting at $30,900. The 2010 Toyota Camry Hybrid is powered by Toyota’s Hybrid Synergy Drive system - the most proven gasoline-electric full hybrid system on the planet, installed in more than one million hybrid vehicles since its introduction in 1997. Each application of the Toyota Hybrid Synergy Drive system is tailored to the model in which it is installed. 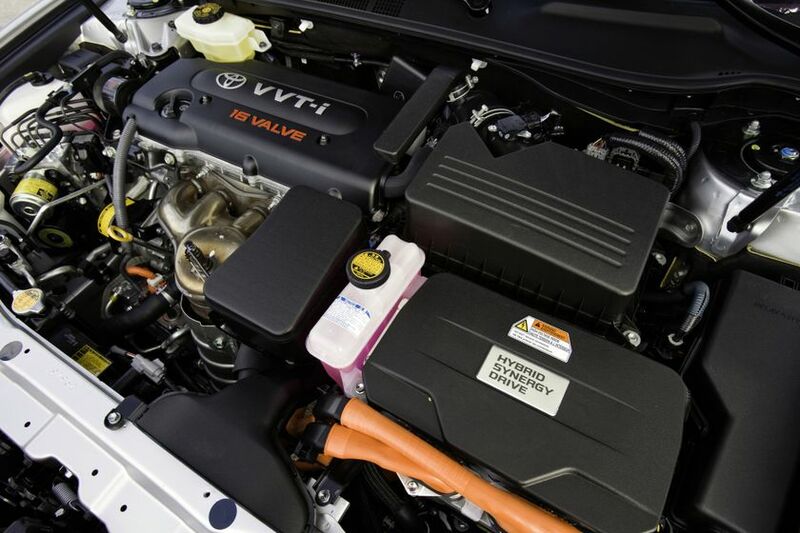 For the 2010 Camry Hybrid, Toyota has adopted a 2.4-litre four-cylinder engine mated to a high-torque electric motor/generator and powerful storage battery to deliver the equivalent of up to 187HP through a much greater speed range than an equivalent gasoline-only power source. For example, the electric motor is able to deliver maximum torque instantly - unlike a gasoline engine, which only delivers maximum torque at high engine RPMs. The result is seamless, powerful acceleration at any speed, with just a touch of the throttle. The Toyota Hybrid Synergy Drive system also delivers up to 138lb-ft of torque @ 4,400RPM, while qualifying the Camry Hybrid as an emissions-friendly Tier 2 Bin 3 vehicle. In fact, the Camry Hybrid exceeds the world’s most stringent emissions standards, including California’s benchmark Advanced Technology Partial Zero Emissions Vehicle regulations. The mid-size, four-door, five-passenger Camry also achieves a fuel-efficiency rating of 5.7L/100km (combined city/highway) – comparable to that achieved by many sub-compact cars. 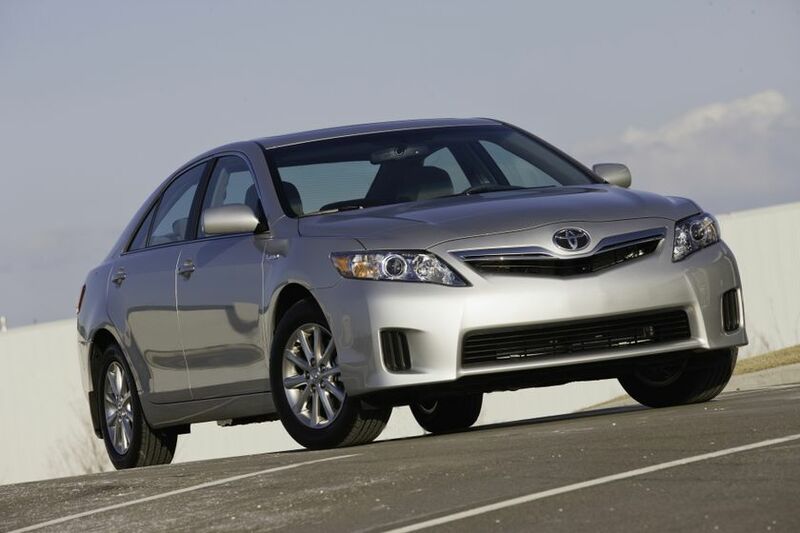 The 2010 Camry Hybrid delivers an exceptional driving experience. The system’s continuously variable transmission and front wheel drive enable the Camry Hybrid to accelerate confidently, quickly and surprisingly smoothly – with no shock or lag time from gear shifts. Handling prowess draws on a full suite of Toyota control technologies, including the state-of-the-art Vehicle Dynamics Integrated Management (VDIM) system, Vehicle Stability Control and Traction Control. Handling and control are enhanced with a suspension designed to deliver a comfortable, stable ride under a variety of conditions. The Camry Hybrid features Macpherson gas struts, coil springs and stabilizer bars fitted front and rear. The rear suspension is an independent, dual-link design. Toyota’s electrically-driven rack and pinion power steering not only delivers a highly responsive steering feel at all speeds: It’s also more environmentally friendly, since it uses no power steering fluid and weighs less than conventional hydraulic power steering systems. Driving situations develop quickly, which is why the 2010 Toyota Camry Hybrid features the superior braking power of Toyota’s Power Assisted Antilock Braking System with Electronic Brakeforce Distribution and Brake Assist. Front ventilated disc brakes and rear disc brakes deliver ample stopping power. Ride comfort is enhanced with 16” wheels. finishing touches such as a leather wrapped steering wheel and shift knob and dual zone climate control. Safety is all around in the 2010 Toyota Camry Hybrid. LED tail lamps are not only more energy efficient and longer lasting, they’re also quicker to light and easier to see for drivers following behind. Standard in-cabin safety systems include seven airbags (driver and passenger, front seat mounted side, driver knee, front and rear/side curtain) and three point lap and shoulder seatbelts in all five passenger positions, including adjustable front passenger shoulder belt anchors as well as pre-tensioners and force limiters for the front seating positions. Younger occupants are protected with anchor points for child-restraint seats and child protector rear door locks. Buyers may personalize their 2010 Toyota Camry Hybid by visiting Toyota Canada’s web site (www.toyota.ca) or in any Toyota Dealership across Canada. The 2010 Camry Hybrid is provided with Toyota's no deductible, no transfer fee, comprehensive warranty that covers the entire vehicle for three years/60,000 kilometres. Power train components are covered for five years/100,000 kilometres, while hybrid-specific components are covered for eight years/160,000 kilometres. Major emission control components are covered for eight years/130,000 kilometres, while the vehicle is covered against corrosion perforation for five years with unlimited distance. Includes: In-dash four-disc CD changer; Four-way power adjustable passenger seat; leather seat surfaces; heated front seats; DVD-based navigation system; back-up camera; 7.0” Liquid Crystal Display monitor. The Toyota HSD system is customized to each model. On the Camry Hybrid, the Toyota HSD features a 2.4Litre four-cylinder gasoline engine mated to a high-torque electric motor, a powerful storage battery, and a sophisticated energy management system. The system allows the gasoline engine and electric motor to work independently or together, switching seamlessly between modes as driving conditions demand. At startup and low speeds, when energy demand is low, the Camry Hybrid is powered by the electric motor. When slowing down or braking, the Camry Hybrid’s regenerative braking system uses kinetic energy to generate electricity and recharge the battery. With 187 horsepower, available across a broad band of engine speeds, plus up to 138 lb-ft of torque available in a large power band, the Toyota Hybrid Synergy Drive gives the Camry Hybrid plenty of power and impressive acceleration. A significant reduction in smog-forming emissions compared to a conventionally powered vehicle, giving it a Tier 2, Bin 3 emissions rating. Remarkable fuel efficiency on par with many sub-compact cars. Features: Dual overhead cams; 16 valves; Variable Valve Timing with intelligence (VVT-i); Electronic Throttle Control System with intelligence (ETCS-i). Fuel efficiency 5.7L/100km city; 5.7L/100km highway; 5.7L/100km combined. Vehicle Dynamics Integrated Management (VDIM) is the most sophisticated handling and control system Toyota offers. Specially tuned for each vehicle on which it’s fitted, VDIM uses information from computer-linked sensors to compare actual vehicle performance to driver commands. In this way, it’s able to anticipate potential vehicle stability problems such as a skid or slide. VDIM then makes subtle interventions through a combination of braking, throttle, and steering – in most cases, invisible to the driver – to maximize control.